Let’s face it; there is no good place to dry your washing. Clothes horses are ugly and impractical. For 24 hours or more you have to squeeze around, duck under and dive over your laundry. That’s where TopLine Clothes Line drops down and saves the day. “No messy looking airers on the balconies of apartment blocks, no washing lines on display on waterfront properties. No more floor space wasted with washing hanging on airers, just nice and tidy clothes lines keeping your wet clothes out of sight,” explained founders Ken and Debbie Rogers. Hang your clothes on this machine and use the remote control to raise the clothes up, up and away! Yes, instead of bumping into your clothes, they will simply hang above head height. Somewhere the dog can’t get. It incorporates an intuitive fan and heater to dry your clothes ready for the big event tomorrow night. It comes at a perfect time when tiny homes are taking the stage. An ageing population now live in granny flats and singles or couples occupy little apartments in the centre of the city. All these options have one thing in common: they’re small! The TopLine Clothes Line maximises limited space. Making way for the more important things in life, like wine racks. There are some nifty little gadgets packed in there too, like the ability to use your smartphone as the controller. An LED light so you can really see what you’re doing. A sensor will detect if there is movement under the hood and will automatically turn off when not in use. “From apartment owners looking for a way to reduce their electricity costs. So they can dry their clothes without using their tumble dryers or getting complaints from the body corporate to large developers and commercial dry cleaning.” said Ken and Debbie Rogers. Quality is what sets this contraption apart from competitors. The aluminium is the same used on aviation. The rigid design can take 35 kg of wet laundry and even your sheets on the bigger models. A 24-month warranty exists for parts and labour extending to 5 years for the motor. The lightweight aircraft design means it only weighs between 14kg – 17kg depending on the model. For those of you with little ones running around, safety is paramount. If anything (or anyone) gets in the way of its movement, the machine will quickly stop to prevent damage or an accident. There’s also an innovative safety cut off switch to prevent overheating. For those of you with an eye for design, the model is available in rose gold. Remember to hang your clothes from a hanger to ensure minimal creases when ironing. ……...Model…………. …………. TopLine 80…………. …………. TopLine 120…………. ………….TopLine 150…………. Installation is recommended by a handyman (or handywoman). 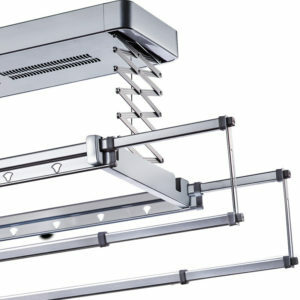 They can quickly and safely mount the device, especially important if you have high ceilings. An electrician is also required to hardwire the equipment as it cannot plug into the mains.